So far under the [Location Factor] article series, we’ve see timber, paper-pulp, fish, wool, cotton, textile, silk and jute industry. Now let’s take a look at wheat, corn, rice, milk, meat, vegetables and wine. Since UPSC syllabus contains separate topic of Indian agriculture, I’m not dwelling much into Indian food crops: wheat, corn, rice or food processing here. Disclaimer as usual: I haven’t bothered much to dig internet, this is mere compilation of wisdom, a few big examples from books. It is your job to dig further as and where necessary. Flat terrain= machines can be employed @every production stage (=useful because population is scarce=laborers hard to find, and expensive to hire, unlike Asia). European settlers seized opportunity, bought large farm holdings @throwaway prices=> farms have area of several thousand acres. Since farm is large=mechanization possible= don’t need many farm-workers. Canada =less population density =hard to find cheap labour, but since farm holdings are large and on flat terrain=most of the work is mechanized. Many branch lines are constructed to connect even the remotest farm regions with the mainline = easy to send your produce to market. Grain elevator storage facilities along the railway lines: here wheat is cleaned, graded, processed and stored. Canadian wheat board, a statutory body= sole purchaser and seller of foodgrains for export. The board coordinates movement of wheat to major terminals. Farmers are given schedules to send their wheat to nearby railway station. + provides quality control for exported wheat. Soil Suitable for rice cultivation + as we saw earlier in the silk article, the waste from sericulture is used as fertilizer. Mechanical rice planters to plant the rice seedlings. Transport Yangtze river=inland transport, connects many important markets/cities.+good railway network. 300 households Leasing land to “team”, soil conservation, Road construction, small scale plants, reforestation and other local Administrative functions. 30 households Producing crop as per the ‘quota’ given to them. Later more reforms were taken viz. Work points/cash: farmers were given these rewards for producing more than the quota given to them. “Responsibility system”: farmers leased land directly from collectives, if they produced more than “quota”, they could use/sell the surplus on their own. Loans directly made to farmers (instead of brigade/teams). Private ownership of agro-machinery allowed. China grows food crops grown on its best lands. 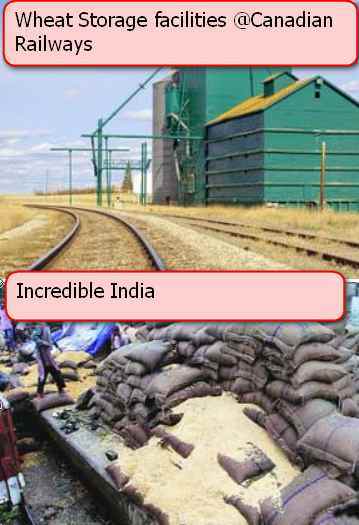 India grows cash crops (Cotton, sugarcane, Jute) on its best lands. It extends nearly thousand miles from Central Ohio to Illinois, Indiana, Iowa, Minnesota and eastern Nebraska. In the heart of US Corn Belt, most of the revenue is earned from beef and pigs. Some large-scale operation have more than one lakh cattle at a time. It is effective for fattening animals. We already saw that location away from market:= product is ‘concentrated’ to compensate for transport cost. Same happens here. Most of the corn produced=used for fattening animals=> animals sent to slaughterhouses in Chicago and Omaha. Federal Government spends billions of dollars per year in subsidy to corn farmers. once seeds are planted, no labour needs arise other than spraying pesticides for weed control and fertilization but that too is done with help of aero planes because farm holdings are so large. for harvesting, outside contractors with crew and machines are hired. This has led to new type of farmers known as suitcase farmers: they live more than 30 miles away from their farm, in large urban cities. In the next article will discuss the geographical factors of affecting the location of milk and dairy industry in USA, Europe and New Zealand. Thank u sir for this Remarkable work…..
UPSC have declared dates for 2014 exam. I also saw that news. but why that mcuch delay? any clue? really? ?..where you found this news?? upsc announced? Could you please suggest some reference text for the purpose of GS paper? There are lots of material floating around on net and some of the bulky books are being recommended by various forum. It would be great help if you could provide few pointers on this, we could use them as reference or supplements. Above request was in reference to Geography part only. IS IT TRUE THAT UPSC PRE WILL BE IN AUGUST 2014. Has UPSC made u official spokesperson?.. Shut your mouth till result is out.. If u r doing preparation for UPSC….try to improve ur behaviour which plays big role in ur personality and ultimate ur thought process.I do not know which words hurt u so much that u r using words like SHUT UR MOUTH…….May be i m wrong and have no hesitation to say sorry if u really hurt…What i wrote above heard from some friends…..BE human beings Dear…..I know u can give me suggestion with other words also….Improve tolerance in ur nature….Thanks…nd Sorry once agains if hurt u…..
lesson1: lets not spread baseless ridiculous rumors on this great site just because you heard something.. because every body hears something daily like cutoff>250. Lesson2: lets be sensitive to lakhs of aspirants who are waiting for result today and already gone through lots of ridiculous lies and baseless cutoff predictions, and atleast spare them for the day of result. lesson3: learn to shut the mouth at appropriate time and place as it can play big role in your personality and civil life. Well so much for your prophecies. The result aint out yet :P lolzz..
when will be UPSC CSE-P results declared? result is coming today dat even i heard from some officials but cut off is 241 dat i did’t came to knw …..
Who told u abt cut-off so high ?? I guess its rumour n if not den only god help us !! Mine also heard from some friends in Delhi..
i m in range of 230 to 240.. So very nervous..GOD only help me now. Source is not credible n hence we ll hav benefit of doubt , so just chill n relax till evening if its coming today !!! Is c.s is a game of uncertainties !! So lets pray dat almighty n hav faith in OURSELVES !! NO 230 IS ALSO NOT POSSIBLE..ACCORDING TO MOST OF THE WEBSITE’S SURVEY MORE THAN HALF OF THE ASPIRANTS HAVE SCORE BETWEEN 190 TO 22O…SO LETS SEE WHAT THE UPSC DECIDE..
half of the aspirants wont clear prelims. only the top 5 percent clear prelims. We like in democracy , we have rights to debate , discuss …. So if u dont like it n dese arguments raises ur temperature n tone den u better keep ur mouth shut !! Wont be dat much more appropriate ?? If above statement hurts ur ego den m sorry but i didnt intend dat way , wat m trying to emphasise is we must give considerations n respect to other ppl’s view also …. Atleast life has taught me dis lesson ! Rest upto u , no hard feelings for u !! Sir plz post mains strategy now , its high time now though we all know it requires lot of time for ur quality reasesrch !! dude..u are really funny..are u KD..coz that post was for KD and not for u..n there is a difference btw democracy and idiotocracy..those who spread false rumors and panic among serious candidates that too at the day of result has to think twice..
first of all i already said i didnt intend to insult u and above all i said sorry also…..
n dat i didnt knw dat comment was meant for KD coz i access dis site on my iphone !! anyways in todays environment around d globe i hardly find any distinction between democracy and idiotocracy if i go by d definition of democracy. Todays reality is totally in contradiction wid dat…….. on top of it wen u talk of realizing it , all honchos say start a political movement, take part in election n wat not , realizing the joke dat for even registering a political party u requires nomination by few MP’s( our protector is our devour) ……….. dey say “right to recall” cant work coz shear size of dis democracy…… and for babus of bureaucracy , one upsc chairmen said dont knw why wen dey enter d service dey r so dedicated n brilliant but within a span of few years dey turn corrupt and inefficiency bounds dem….. all are not but den many suffers from Appleby’s ” action shyness ” …………. moreover my illusion wid developed world got at an ebb wen i came to knw less den a million in US are millionaire in comparison to senate more den 54% members are millionaire ……… and if developed world is promoter of peace and tranquility den abreast dey finance war in congo to plunder its wealth of twice d gdp of US $23 trillion………..
we do live in idiotocracy ! sir please tell me about territorial army examination syllabus . and books for it . I understand ur emotions and tensions.. But be calm. Everything will be good. But yes, Its a public forum, and KD is also worried just like you. Be empathetic, that should be the main goal of every human being. 3.UPSC not to give prelim marks to candidates (just like last year).They will do it after the whole process is over. He did not know the details about the cutoff for SC ST OBC and PH candidates and he said that the results will be put up on site in next 4-5 days subject to availability of chairman. I must say that we can take him seriously as earlier also he has told me certain things in advance which have turned out to be true.I do not intend to speculate anything and as i rely on his info i thought of sharing it with you all. wow! does this head clerk give you the questions of the exam also ? ur disloyal(for UPSC)-“Whistle-blowing”-head clerk uncle is misleading you.. I am working as P.O in a bank, I don’t get much time to devote for my studies. plz guide me how to prepare for UPSC exam. Ur work s really awesome…. if that’s true then the cut-offs have substantially gone up. After reading your post I have stopped reading any book. Bcoz I am not going to get such high score. Thanks anyway for sharing the information and best of luck to all. Assuming your revelations are true, how did your ‘source’ TRUST you with secrets? I mean when you go to any lengths, to prove your authenticity, by giving minute details, how on earth did some find you trustworthy? I do not know how reliable is ur source but sure i m that ur prophecy abt cut off is going to be wrong…. Dear frnd upsc clerks or officers are bound to confidentiality clause….i wud luv to know how u correct u r?? is ur source ur relative? how come ifos cutoff is so less when they have only 85 vacancies and about 1500 would write mains? i never saw any of ur comment about syllabus change that time here? there r tons of rumors already!! So, why csat 2014 is on August? why that much delay? so whether they will postpone the date of mains too? any idea? Actually,UPSC exam is one of few the exams where one should not keep certainty regarding timing and dates comparing from one year to another.Next year ” delay ” in Prelims might be due to Elections,or might be UPSC thinking to reduce the overall time span of the whole exam process(so initiating it from 2014!). So,mantra for success is integrated preparation for prelims and mains so that the ” less” time between Prelims and mains don’t bother you………. Dont go by the rumour. If you wait until the result, not many days u’d loose..
why is the indian overseas bank charging 3.30 lakh training fee apart from 2.00 lakh security ?? A) It should be “ridiculously” not stupendous. THere is a world of difference. B) IOB stands to make a whole world of money, both as an institution and corrupt individuals, from this scheme. Baba, Look at it in this way, You are paying for the MBA in Banking & Finance along with an assured job! EXCUSE ME! Please stop this nonsense…… Mrunal Sir is working hard to provide us with some useful stuff and we,creating rumors….Does it make any sense? Please focus on coming mains, don’t get tensed. Whatever be the result accept it fully. bt i dont think and i hav a strong feeling too that its not correct info… if ur source is knowing the cut off of CS and IFoS for general and he is also knowing abt the no of candidates qualified then i dont think he might not be knowing abt other category cut off. when will the CSE 2013 pre result be out??? IBPS i asking for preference choice for 21 banks….i dont know what to fill….need your help….kindly guide sir ! !…will be thankful to you!! What actually is your target? If you wish to leave the Bank job after some time, list all the banks with no bond amount and then in the increasing order of the bond amount ! P.S- You can keep ECGC at first position. plz if anyone has the correct and authentic information , then plz tell us the cutoffs of all the categories … if u dont have … then plz dont spread rumors ….. i have the score of 220 (obc category ) whether it is safe or not ….. plz tell . people r saying about 231 (general ) …. it is causing distress …. emotional intelligence is the key factor for us…so lets practice till results announced…. Donot be panik….U r safe as per my intelligence guess…..I had last year experience….Wasted 2 months….So NAR HO NA NIRAS KARO MAN KO,KUCH KAM KARO…. Just wanted to ask you, what kind of experienced you had? I mean whether you underestimated your score because of the keys available in net and got something beyond that? Could you please tell what score did you expect initially and what was your final score? Initially i calculated score 162 with different keys but final score was 192.So you can never believe in these keys fully…..according to different keys my 6/7 decision making questions were wrong but later i found all (7/7) correct as per UPSC keys…..
i just called Mr.Mukhopaday(DEPUTY SECRETRARY) UPSC and asked about Result..He told before Friday….Eeeeeeee suddenly, i asked abt CUT OFF….he told “wo kaise bata sakte hai”…..